Rob Duncan is the MU Vice Chancellor for Research. During fiscal year 2009, MU researchers spent more than $543 million on academic contracts, including research, instruction and public service, academic enterprise, and externally funded student financial aid. COLUMBIA, Mo. ­— While economic woes are in the news nearly every day, researchers at the University of Missouri have experienced the opposite trend as they have attracted record levels of grant money to the region to study problems in several fields, including electrical and computer engineering, physics, biological sciences, agriculture, medicine, psychology, business, and literature. During fiscal year 2009, MU researchers spent more than $543 million on research, instruction and public service, academic enterprise, and externally funded student financial aid. This is an 11 percent increase from the previous year when researchers spent roughly $489 million and a 38 percent increase from five years ago. $6.8 million to the School of Medicine to encourage rural doctors to start using electronic health records. Experts say the increased use of electronic medical records could save lives. $3.1 million grant to the College of Veterinary Medicine to expand research on biological joint technology, or using living tissue to replace damaged joints. $5 million grant to the Department of Physics in the College of Arts and Science to increase physics instruction in Missouri high schools. $1.4 million to the College of Engineering to develop technology that would detect falls and atypical behavior among retirement community residents. $1.5 million to the Bond Life Sciences Center and the MU School of Journalism to address the difficulties of communicating science to the public. Researchers also benefited from funds made available through the American Recovery and Reinvestment Act (ARRA). Currently, MU has been awarded more than $64 million for 91 projects through ARRA proposals. 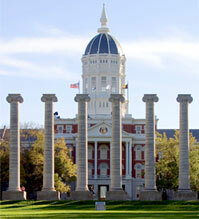 Mizzou officials also have been working to take the discoveries resulting from this research and create new businesses. In FY 2009, Mizzou researchers filed 68 patent applications and the university received more than $10 million in licensing income from MU inventions. This is up from the 49 patent applications filed and $6 million received in royalty income in FY 2008.